Israeli plans to build more than 300 new homes in the disputed east Jerusalem neighborhood of Har Homa won't help efforts to build confidence with the Palestinians under the revived Middle East peace process, US Secretary of State Condoleezza Rice said Friday. 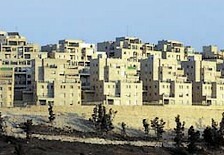 Apartments in Jerusalem's Har Homa neighborhood. "We're in a time when the goal is to build maximum confidence between the parties and this doesn't help to build confidence," Rice told reporters after a meeting with Foreign Minister Tzipi Livni on the sidelines of a NATO meeting. On Tuesday, Israel announced plans to build more than 300 new homes in Har Homa. Government spokesman Mark Regev said Israel has explained to the US that the building tenders were the legacy of past governments. "In this current decision to build, neither the Prime Minister's Office nor the Defense Ministry was involved in the decision-making process," Regev said. "We're talking about Jerusalem, Israel's capital, and Israeli law applies, and this was done through the regular, routine procedures." The new housing would expand the neighborhood of about 4,000 residents in an area Palestinians claim as the capital of a future state. Palestinian officials appealed to the US to block the project. UN Secretary-General Ban Ki-moon was asked at a news conference Thursday whether he considered Israel's decision a violation of the roadmap and the commitments at the Annapolis peace conference. "The United Nations' position on the illegality of settlements is well known," Ban said. "These new tenders for 300 new homes in east Jerusalem so soon after this Annapolis Middle East peace conference, I think, is not helpful. I will be discussing this matter with my Quartet partners."